After getting plenty of flack for not wearing an American designer to last week's State Dinner with Chinese President Hu Jintao, Michelle Obama played by the rules and chose a silvery-gray sheath by Rachel Roy to last night's State of the Union. The First Lady accessorized with a silver stack of bangles, dangling earrings and a black and white ribbon honoring Rep. Gabrielle Giffords who is recovering from the assassination attempt on January 8th by a crazy gunman. 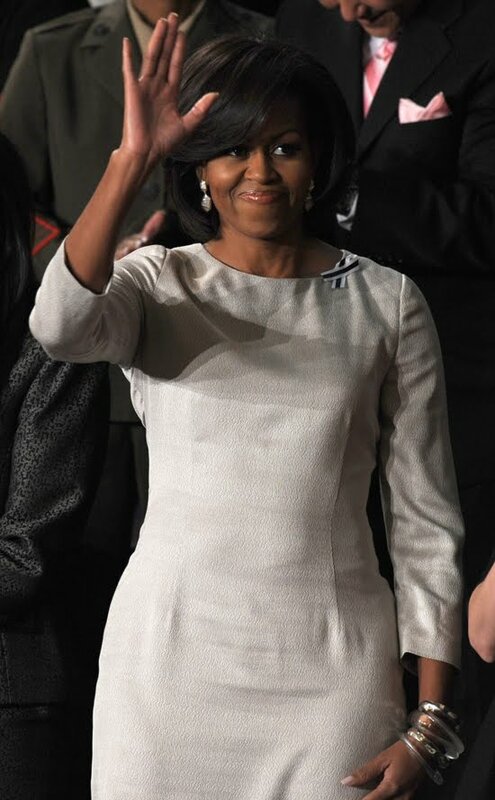 FLOTUS looked lovely in her American-designed creation and of course patriotic attitude. Hi Katie! Agreed. Her outfits are heavenly but she never looks like she's trying to hard. Effortless and chic. Love her! She looked so great at that event, just like the First Lady should.